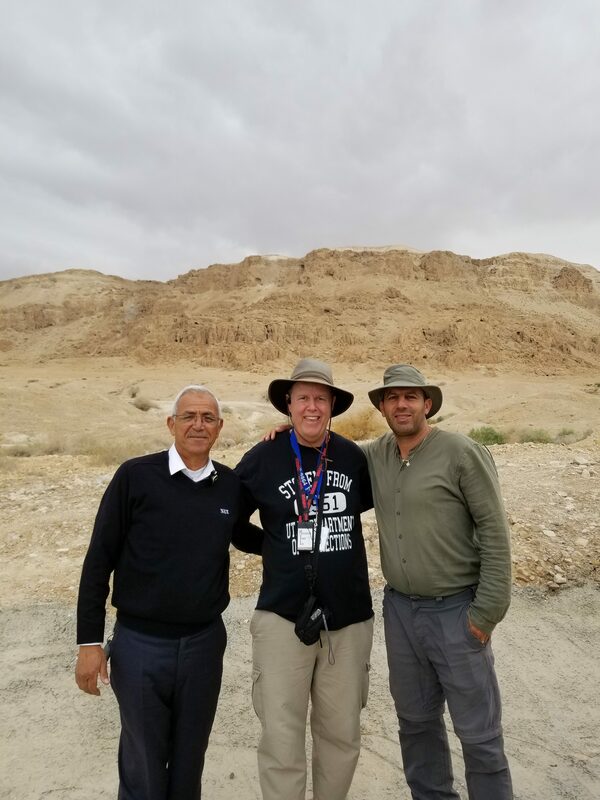 Photo: Our scheduled guide Andre (right) with scheduled bus driver Azam (left) and Eric Johnson in front of the hill where Cave 1 (Dead Seas Scrolls) near Qumran. This will be a trip that will forever change the way you read your Bible! But hurry, limited room! To sign up online for this trip with a $500 deposit, click here. To fill out a hard copy, click here and print the PDF. (Better if you can fill out the online registration form, as this is a first-come, first served registration process.) To see the insurance policy, click Allianz Travel Insurance. Today we will all meet for our nonstop flight to Munich, Germany on Lufthansa Airlines via wide-body aircraft arriving the next day. Meals served on board. We arrive in Munich, Germany today and drive north to the Dachau concentration camp memorial. See the buildings used by the Nazis during World War II and hear the stories of those that lived through this experience. In the afternoon, a walking tour of Augsburg, site of the Augsburg Confession, will bring to light the history behind much of our doctrine today. It was here in 1518 at St. Anne’s Church that Luther met the papal legate, Cardinal Cajetan, who demanded that Luther submit to the pope. Augsburg was also the site of another Imperial Diet (1530) and in the town hall the Peace of Augsburg was signed in 1555 ending for a time the religious wars in Germany between the Catholics and the Protestants. Travel north to the beautiful city of Leipzig, Bach’s city, with free time and a visit to St. Thomas Church where Bach was choir master and organist. Continue to Eisleben which is noted among the most significant in Luther’s history; he was born here in 1483, died here in 1546 and old manuscripts indicate that he felt a special affinity to Eisleben. We will see the house of his birth and death, St. Andrews Church where he preached his last sermon, the Luther Monument, and St. Anne’s Church with the famous Biblical scenes hewn in stone and many other sites. We continue on the Reformation Trail today with a visit to Wittenberg where Martin Luther lived and taught for 36 years. You will see the Castle Church door area where Luther posted his 95 Theses, giving birth to the Reformation. This beautiful church is also the burial site of Luther. We see the Luther House which is the greatest museum of Reformation History in the world with a detailed history display of his life and accomplishments, historical documents and an outstanding collection of period paintings of his life and family members. Continue to Berlin where we enjoy an inspirational guided tour of this fascinating city including the “East Side Gallery”, the longest continuous and still standing section of the Berlin Wall, the infamous “Checkpoint Charlie”, the majestic main gate the “Brandenburger Tor” and nearby “Holocaust Memorial,” a memorial to the Jewish victims of the Holocaust. NOTE: $100 bonus will be received by paying travelers (excluding Eric) if we travel 40 or more to Israel. This trip is limited to one bus, so there is limited room available. Today we will meet at a Southern California airport for our connecting flights to Israel via wide-body aircraft arriving the next day. Meals served on board. We transfer to our flight to Tel Aviv and meet the rest of the group that has spend the past few days on the optional preextension in Germany. Upon arrival in Tel Aviv we are met by our guide who will be with us for the time we are in the Holy Land. Board our bus and travel through Tel Aviv, proceeding to the city of Netanya on the Mediterranean to our hotel where we will check in for overnight. Today we go to the northern part of Israel (Galilee), starting with Chorazin and Bethsaida before driving through the Hula Valley to Hazor, where we will see ruins of the powerful Canaanite city destroyed by Joshua and rebuilt by King Jabin and then by Solomon as a chariot city to command upper Galilee. We continue to the northern limits to Dan where we combine a nature walk beside the Upper Jordan with views of the ancient ruins, topped by the Israelite high place that supported a golden calf (I Kings 12). Next we’ll take a short drive to Banias (Caesarea Philippi), dedicated to Pan the Greek god of pastures, flocks and shepherds, where Peter made his great profession of faith. Driving along the base of Mount Hermon, we ascend onto the Golan Plateau for a magnificent view of upper Israel and have lunch. On our way back, let’s stop by Magdala along the Sea of Galilee and visit Mary Magdalene’s hometown. There is a first century synagogue here, the first to be found in the Galilee region. Return to the hotel in Tiberias for dinner and overnight. 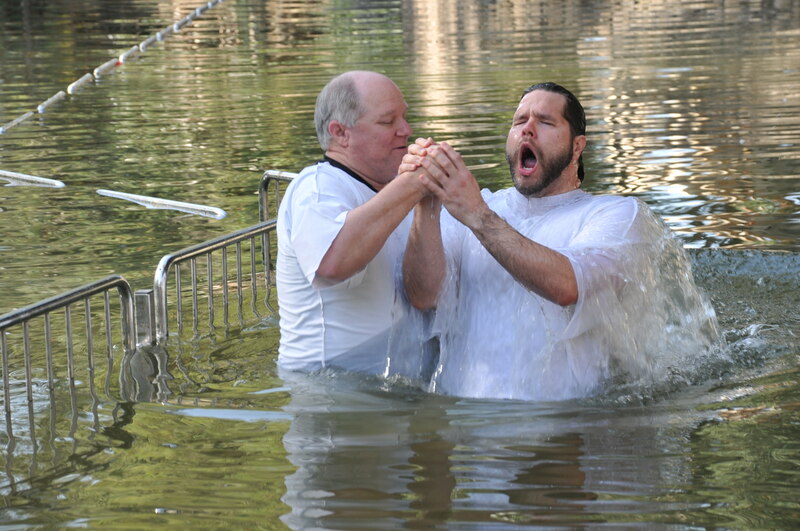 This morning is a special time to practice the ordinance of water baptism. 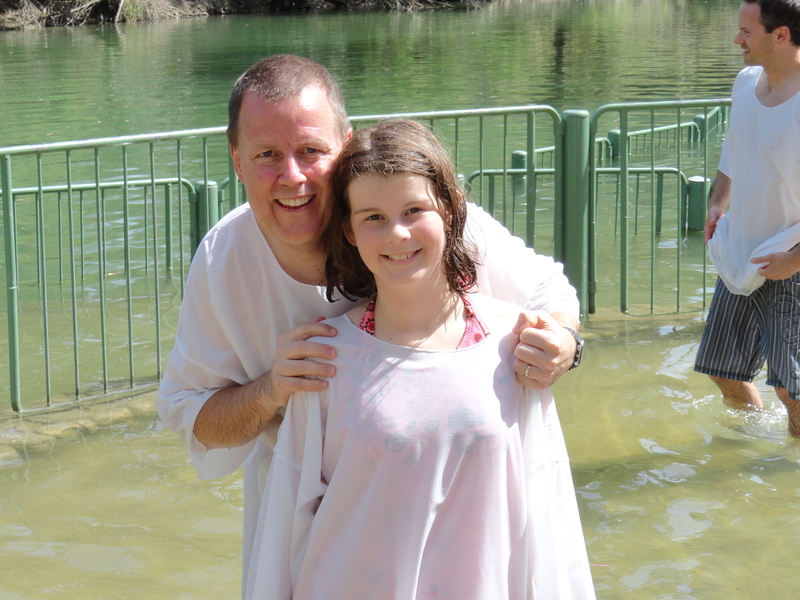 We will go to the Jordan River where those participants who have never been baptized (or who do not remember their infant baptisms) will have a chance to give their testimony and be immersed the same way as Jesus by Pastor Kenny Dodd from Clairemont Emmanuel Baptist Church. Next we continue to Capernaum where the home of Peter and the town’s synagogue can be seen. Let’s have lunch at a restaurant to partake of a St. Peter’s fish (or, if you wish, chicken) meal. After lunch, we visit Christian churches located at Tabgha (loaves and fishes) and the Mount of Beatitudes—a place where we can read from the Sermon on the Mount. Our final activity is taking a boat ride on the Sea of Galilee…how exciting! We will have a chance to hear Christian worship music, dance to Jewish songs, and celebrate our time in the Holy Land. 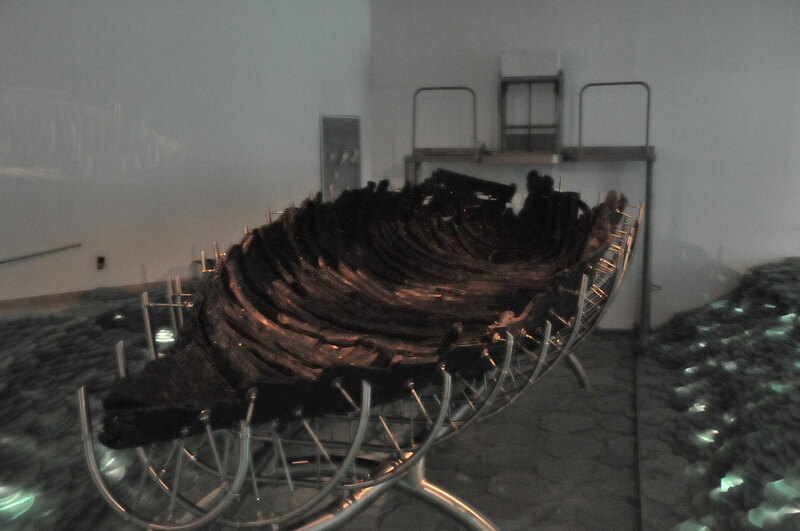 We will also see a New Testament boat found two decades ago during a drought dating to the time of the apostles. We will spend the night at the Sea of Galilee for a third night and prepare for our drive south in the morning. 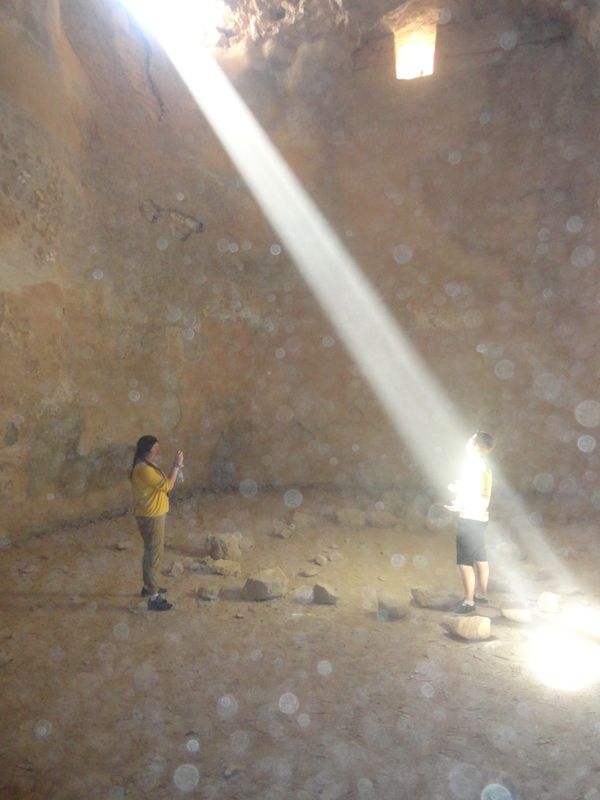 (Photo of cistern on Masada) We wake up early and start the day by taking an extended bus ride down to the Dead Sea, the lowest place on the earth (1300 feet below sea level). After a few hours of driving, we visit Ein Gedi and take in a little bit of Paradise in the desert as we observe the wildlife and hike to a wonderful waterfall. In one of these caves above the waterfall area, David found Solomon and cut off part of his robe. After sampling authentic Bedouin tea or coffee, we head over to Masada and ascend by cable car to the magnificent ruins of the fortress where, from AD 70-73, Jewish defenders made their historic stand in the Judean revolt against Rome. We will have a chance to explore as we walk through the storehouses, cisterns, and palace created by Herod the Great. We then head over to a Bedouin camp to ride camels in the desert—how many of your friends have done that? Finally, we go to the Dead Sea where we have planned a special retreat at a resort hotel. This is a place where you can enter the waters of the Dead Sea for a swim and mud yourself. Or, if you’d like, utilize the basement spa area of the David Resort hotel—just sit back and let the bubbles relax you. 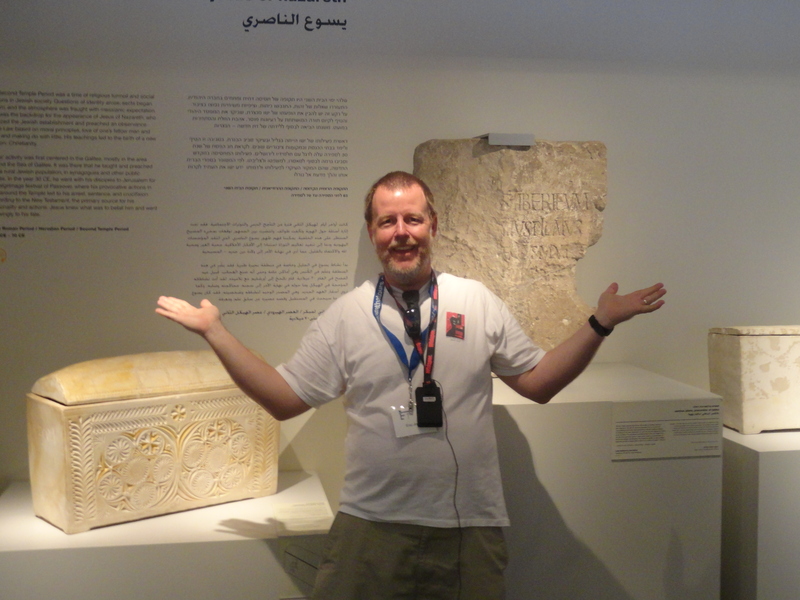 (Photo at the left: The Pontius Pilate inscription at the Israel Museum) Let’s start the story of Jesus right by heading back north to the Herodium, the palace set in a conical mountain that was built by Herod the Great and where his tomb was uncovered in 2007. Remember, it was Herod was visited by the Wise Men. He did what he could to prevent the “King of Kings” from being born, including the “Massacre of the Innocents.” After seeing this man’s monument to himself, let’s go visit one of the possible sites for the Shepherds’ Fields—perhaps we could celebrate Christmas a bit early by singing “Silent Night” inside one of the caves! Bethlehem is where Jesus was born, a direct fulfillment of Micah 5:2. We can visit the Church of the Nativity where, in a basement cave, we will stand in the same place where the Savior was born. We will also visit the quarters where Jerome translated the Latin Vulgate in the fourth century. Let’s take time out for lunch as well as shop at an olive wood store run by believers. Our next stop is the city you have heard so much about, Jerusalem, the capitol of the Bible. We will go to the Israel Museum and see some ancient artifacts, including pieces of the Dead Sea Scrolls as well as a model city of the ancient city of Jerusalem that is a football field in size! We will also have a chance to see such important artifacts as the Pontius Pilate inscription, the Tel Dan stone (with proof of David), and the ossuary of Caiaphas. (Photo at right: Jewish boys at the Western Wall; photo) This morning we will visit the Temple Mount, which is where the Dome of the Rock is located. This is the site where the Holy of Holies was located. We’ll then go down to visit the Western “Wailing” Wall, the holiest place in all of Judaism, before touring the Rabbi Tunnel, which takes us down to the very foundation of the walls. From here, we will stop by the Pool of Bethesda (John 5) and St. Anne’s Church, which is perfectly preserved from the Crusader period – with remarkable acoustics. Why don’t we sing “Amazing Grace” together! You have never heard this hymn sung more sweetly than here. Next we will visit the Southern (Teaching) Steps—Jesus was certainly here, right outside the temple itself. After lunch, we’ll head over to Yad Vashem to consider the effect of the Holocaust. 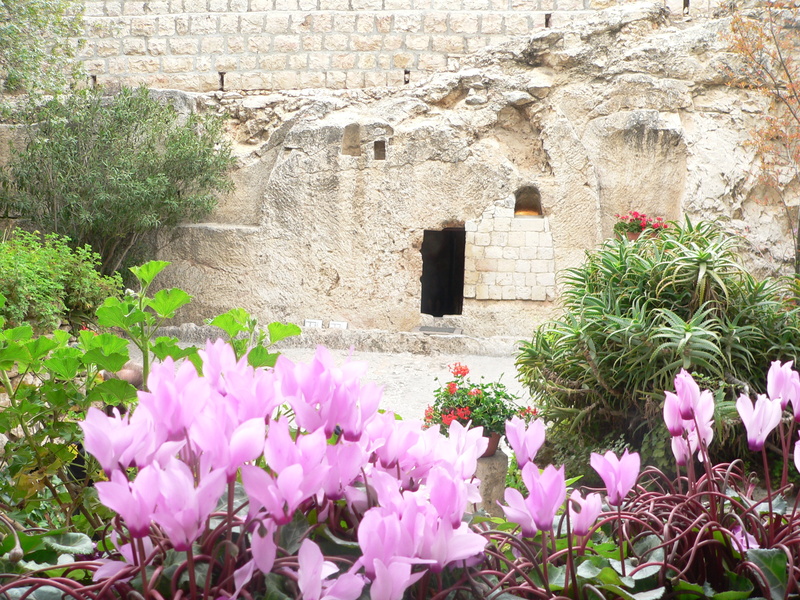 (Photo at the Garden Tomb) We begin the day by heading to the Mount of Olives where we can have a panorama of the ancient city. Then we will go down to the Garden of Gethsemane. There are olive trees in this garden with root systems going back to the time of Jesus! This is where Jesus prayed before getting betrayed and arrested. We then head over to the Garden Tomb! A private communion service led by Pastor Kenny Dodd from Clairemont Emmanual Baptist Church in San Diego will be given at a possible site of the tomb. The words “He is not here. He is risen indeed” will have extra meaning for everyone as we return home the next day from this wonderful trip. After lunch, you will have the freedom to head out on your own or how about some shopping? Another option is to walk on the walls (ramparts) from the Christian Quarter to the Muslim Quarter (extra cost of $5 would apply). Tonight archaeologist Joel Kramer will address our group after dinner at the hotel. Joel will take over the guiding duties for the next three days. 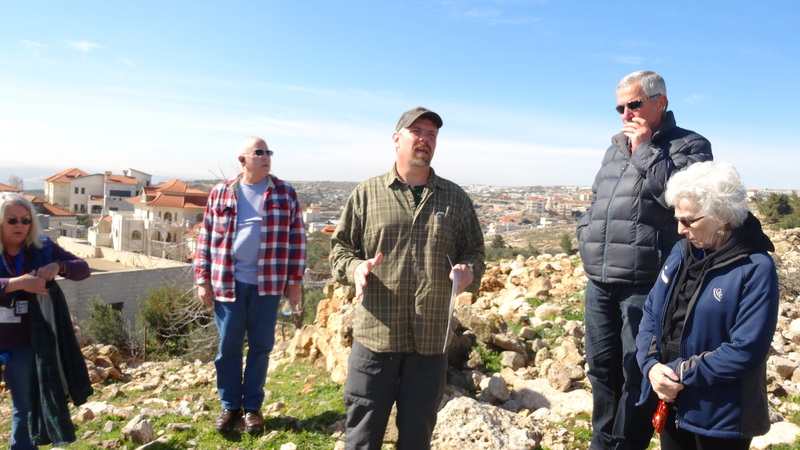 (Photo at right: Joel Kramer at Shechem) (With Joel Kramer) Today we will have a chance to see sites that many tourists will never experience, with Joel Kramer leading us. First, we begin at Ai, the city conquered by Joshua (see Judges). Next to Ai is Bethel, where Abraham pitched his tent. Very few tourists have ever been to these sites. Next we go to Jacob’s Well in Nabalis where Jesus had a conversation with the Samaritan woman (John 4). Drink a cup of cold water from this deep well! From here we head over to Shechem, a place so very important in the Bible located between Mt. Gerizim and Mt. Ebal. Finally, we head over to Samaria to see the Israelite ruins of the capitol of the Northern Kingdom of Israel. (With Joel Kramer) We begin today’s journey by having Joel take us to the place where Pilate judged Jesus called the Pratorium, just outside Herod’s palace. Then we will take the less traditional (but more accurate) walk to the Church of the Holy Sepulcher—this is the place where Jesus was crucified and buried. Although there is plenty of tradition that goes beyond the biblical facts, Joel will help us cut through the incense so we can understand the historical significance of this site. We then head to the Church of the Apostles, marking the place where Pentecost took place. After lunch, we climb into the bus for a special journey to Mamre and Hebron. Mamre is a cultic site where Abraham was, while Hebron contains the Tomb of the Patriarchs, a very important place where the patriarchs and their wives were buried. Today a synagogue and mosque are located at this site. 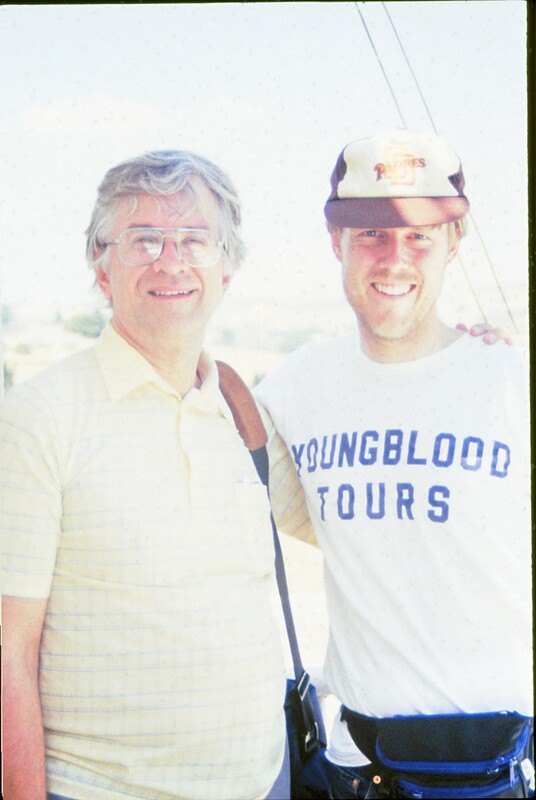 (Photo at right, Hezekiah’s Tunnel) (With Joel Kramer) We start at the City of David to see the palace (and David’s view) on this hill. 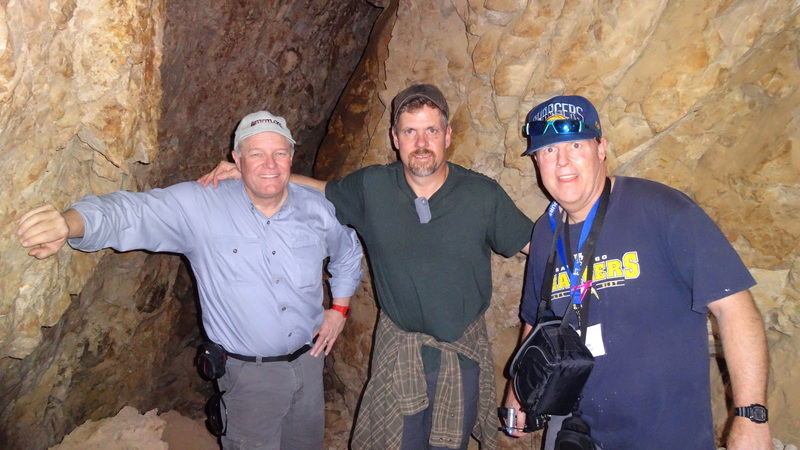 We will then go to Hezekiah’s Tunnel and hike 1749 feet from one end to the other. 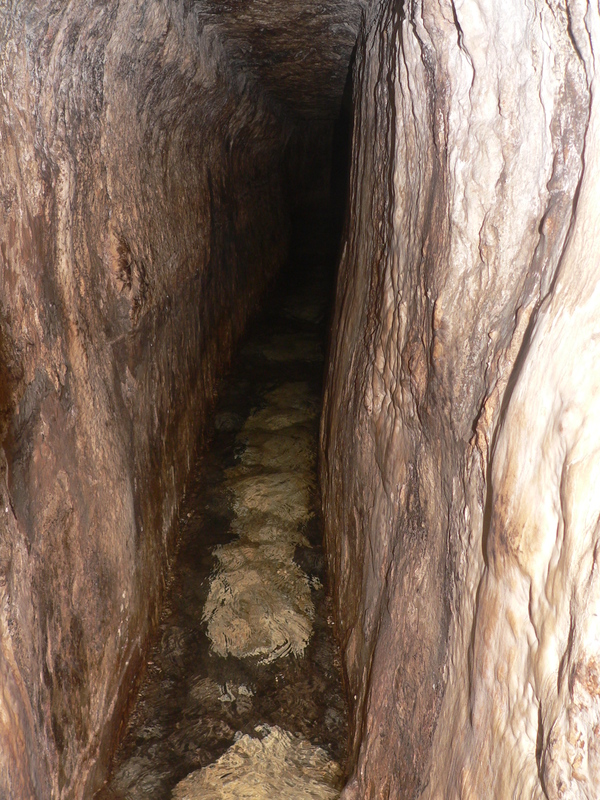 This tunnel was dug by Hezekiah’s men in the 8th century BC. We will also see the Pool of Siloam talked about in the Bible, as part of it has recently been uncovered! And Joel will show us a possible site for the actual tomb of King David in a rock-cut tomb near the Pool of Siloam. We get back on the bus and head over to Qumran, the site where the Dead Sea Scrolls were first discovered in 1947. Ancient Jews called the Essenes copied several hundred manuscripts (later known as the Dead Sea Scrolls), including the earliest copies we have of the Old Testament. We can look around the village where these Jews lived 2,000 years ago. For those in shape and who are more adventurous, we will take a hike up the hill to Cave 1, the place where Bedouin shepherds first found the scrolls. (Warning: this trek is not for the timid! Bring good shoes and gloves to hold onto the sharp rocks.) We will hear a devotional from Joel in front of the cave, and you will have a chance to go inside where the scrolls were first discovered. (Those who are not interested may stay in the Qumran Village and shop for Dead Sea salts and lotions.) Finally, we end in Jericho, the city of Palms, where Joel will give us an on-site “rest of the story” to the complimentary DVD that you received for signing up on this trip. We transfer to the airport for our flight home with unforgettable memories to cherish always. 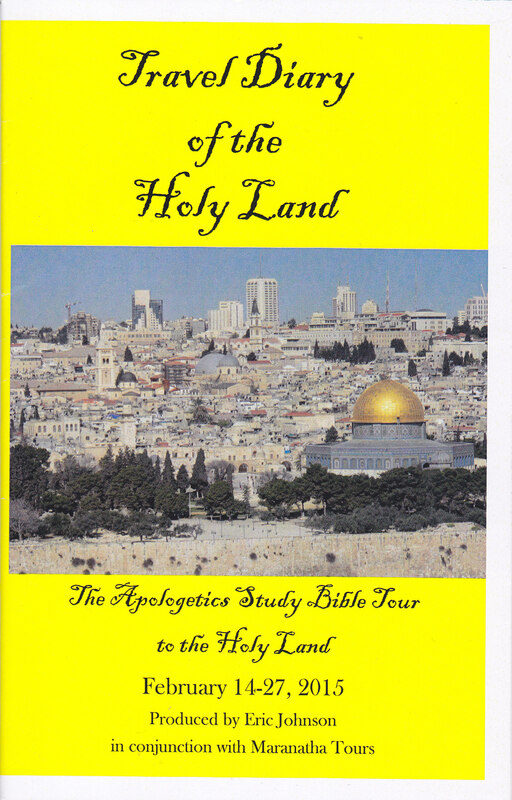 Knowing we have walked in the footsteps of Jesus and the early Christians on such a memorable tour will bring new meaning to our Bible reading. For those who are coming on the optional extension, we will be continuing our journey. $100 additional off the cost of the trip if 40+ passengers travel. This trip will only take one bus and we are limited to one bus only. Check out our 4-star hotels where we’ll be staying. Just click on the hotel name. Joel Kramer has led a life of adventure. (If you doubt this, just read his 2001 book Beyond Fear: A Harrowing Journey Across New Guinea through Rivers, Swamps, Jungle, and the Most Remote Mountains in the World). Joel has produced a number of feature-length and short-length videos on a number of topics, including Mormonism, polygamy, the Worldwide Church of God, and archaeology. (You can order his DVDs on sourceflix.com) Joel served as a pastor at the Brigham City Main Street Church before moving to Israel about a decade ago. Joel has studied archaeology in Israel and has worked hands-on with top-notch archaeologists, including Shimon Gibson. 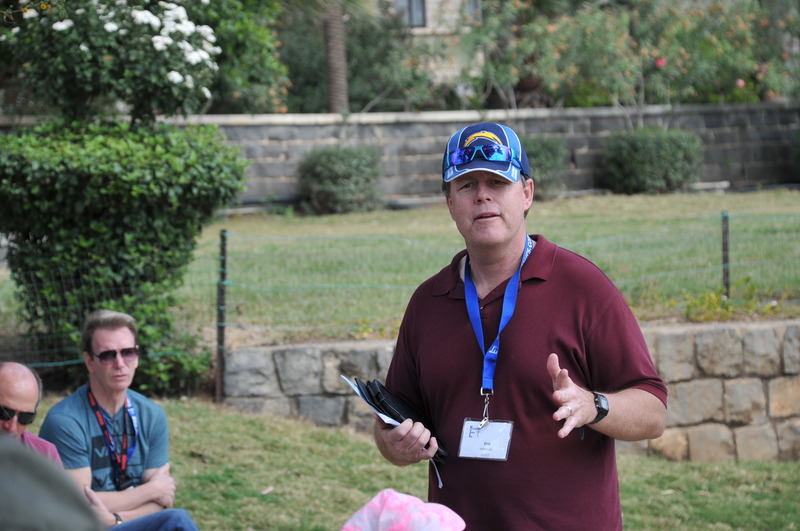 In late 2016, Joel and his family moved to Jordan but will come back to Israel to guide our group to such sites as Jericho, Jacob’s Well, and Shiloh. In the previous seven trips organized by Eric Johnson, Joel has spoken to the travelers or guided us, and he is somebody you don’t want to miss! I have to be honest, I feel much more safe in Israel, even in the West Bank, than I do in Los Angeles, Chicago, New York, and Washington DC! Nobody on my trips has ever felt threatened at any site we have visited. As I understand it, no American tourist has been killed or even seriously injured for decades by any terrorist activity while going on a pilgrimage to Israel. The entire time we are in Israel, safety will be our highest priority. If anything is ever happens in a particular area during our trip, we will avoid that place–the guide will be in constant communication with the authorities. Also understand that governmental security is all around us, especially in sensitive areas such as Temple Mount and the Western Wall. And security is tighter in the Ben Gurion Airport than anywhere in the world. You will be as safe as possible and much safer than if they were in London, Paris, or Rome. So, in conclusion, I believe this is a very safe trip, or I would not have traveled here, without incident, nine times since 2009 and have brought every member of my family!